Here is a list of images of the Allstates. Some are ours, most - as will be obvious - are scans from the Sears catalogs. This one from the 1960 Sears & Roebuck catalog. 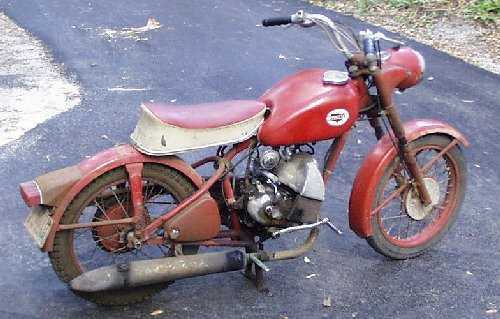 Entire bike is very rudimentary, engine is from a scooter sold by Puch in Europe only. Engine is actually tilted in the frame to accommodate installation into this very simple hardtail frame. My example of this will move on down the road pretty well - much better than I would have expected. Shifting is done by twisting left hand-grip, which moves a lever that pulls or pushes a rod that moves a lever that push/pulls a rod, etc., until it gets down to the rear of the crankcase where a final lever moves the shifter. Later models had a set of push/pull cables to do all that. As best as I've been able to determine, this bike was not merely the usual "Re-Badged" Puch, but was built only for the North American market. 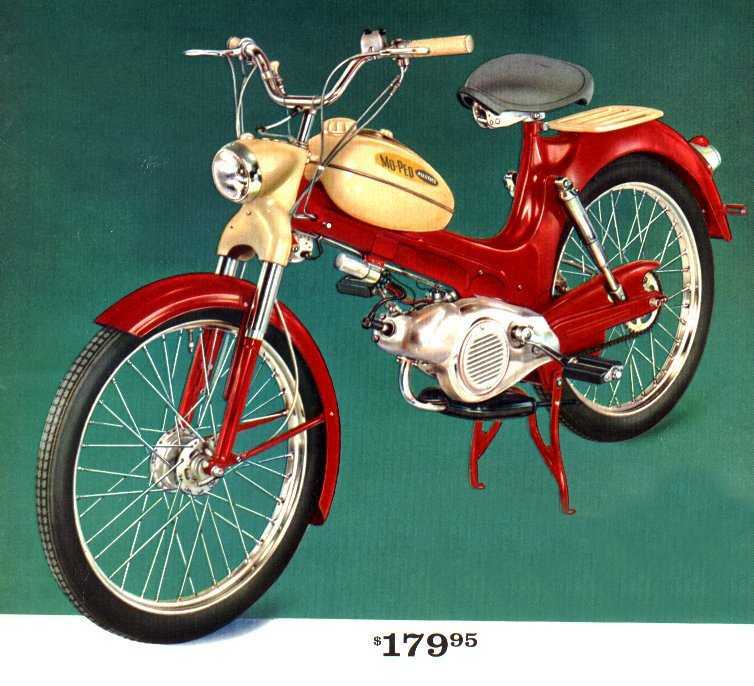 The lack of sophistication compared to other Puch/Sears offerings bears this out well. 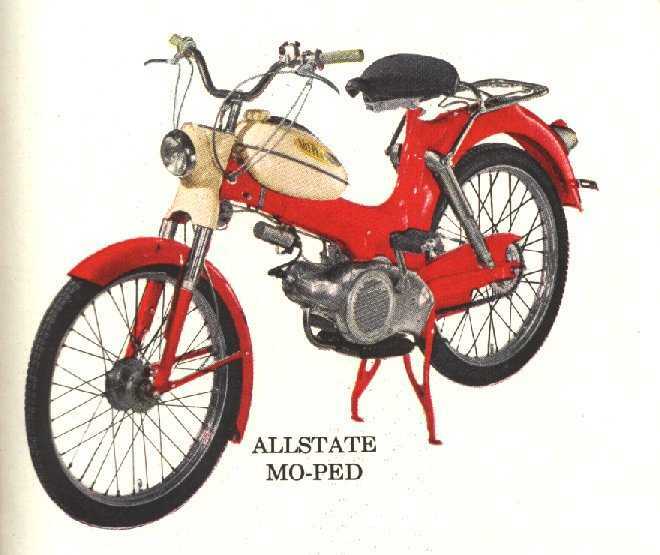 The 175cc split-singles were the first ones introduced by Sears. The 250cc came a little later. 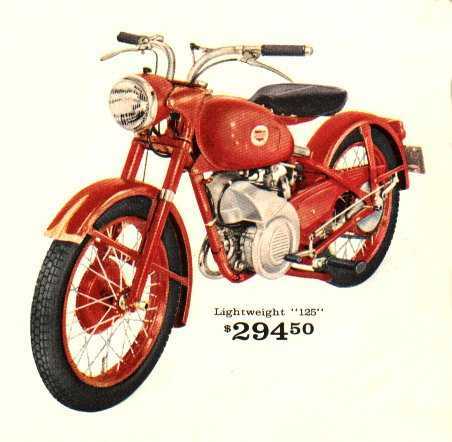 These early models came in two versions - the "Standard" had a fully painted tank and entire bike finished in an appliance blue, with the Deluxe sporting a chromed tank with center color band and rest of bike in a nice, deep burgundy Sears called "Lustrous Maroon." Both had the small oddly-shaped mufflers as can be seen. This particular example has been repainted poorly, and was the Deluxe version originally. I have never actually seen a standard version, so I doubt many were sold. These 175s were really small physically, but amazingly well-engineered, then well-finished on the production line - very sturdy and solid, but with performance definitely set in the low-rpm torquey area, vs. high-rpm horsepower and speed. I no longer have this bike, but, as usual, wish I did. Tanks gained the chrome "Toaster" panels, mufflers became more continental in style and with removable end-caps for de-carbonizing. 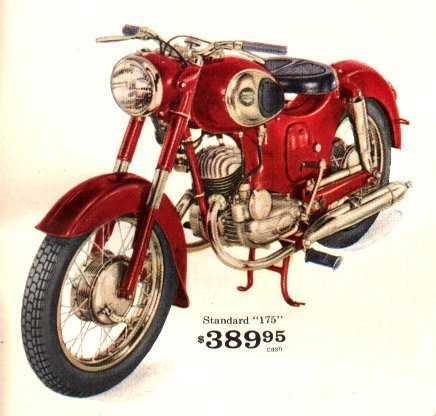 Tanks still had toaster panels, but seat became the dual-version as sold on the 250cc. Lost a lot of its charm with the replacement of the nifty old solo seats. I foolishly traded this bike away for what turned out to be several pieces of junk disguised as motorcycles. The above is the open and closed configuration of the pilot's solo-seat on my old Allstate 175. If one should happen to get a wild hair and decide to run out to the road to get the paper early one morn, while attired in only loose gym shorts and a T, be aware that this device can cause one to sit right back down on the seat in a hurry. Tanks and front fender were changed out to a more modern - at the time, and much less classy - breadbox-style, electrics (lights, wiring, switches) became CEV. Bike was offered in bright red, black, and medium-blue. Basic frame and engine were unchanged. I have since sold this bike, but don't miss it much because of the odd and unsuccessful attempt at updating the styling. This is my one running example of this dubious mechanism. I have two others of the rod-shift variety, but both are missing the same parts every example I see is always missing - the cooling shrouds. Here is a fairly nice example of the mid-series 175cc, with optional pillion saddle installed. Bike runs very well, but will require repaint in some areas to be near-show quality. I will get a better image up shortly. Note that bike is now black, but sports black mufflers as well. 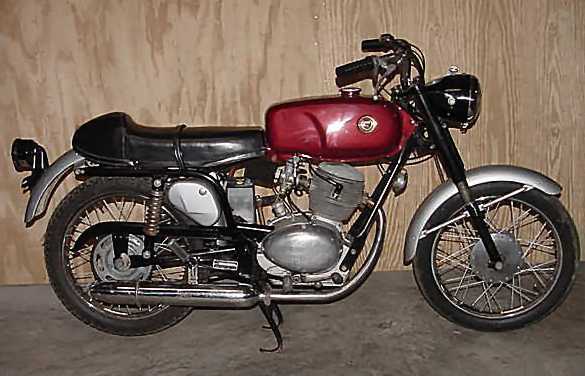 I've never seen one with the black mufflers, and since image appears to be a drawing, not sure they ever existed. 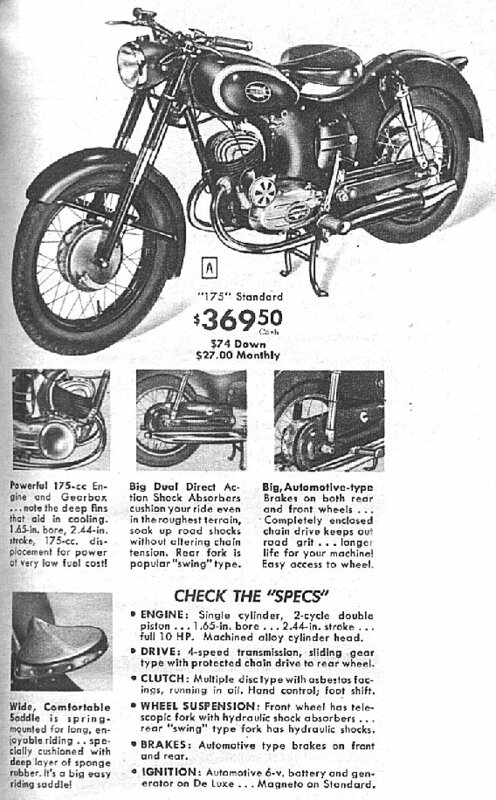 Note that the 175 standard below also shows the black mufflers. "Standard" had magneto ignition and lacked the chrome of its Deluxe brother. Restored by my buddy Harold McLean of Tallahassee. 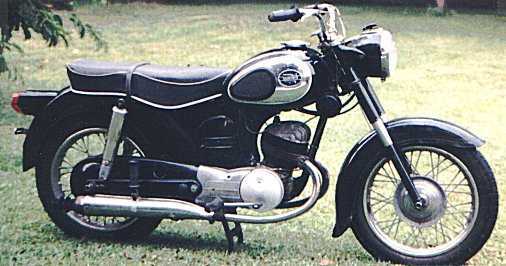 Engine is 60cc fan-cooled two-stroke single, with left twist-grip shift. This little scooter would be dangerous in traffic, as they will barely get out of their own way. 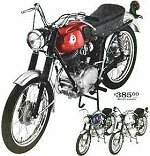 There were two basic versions, one as this with the 'sloped' fuel tank, and the other with a horizontally oriented tank. Some of the horiz-tank versions were finished in nice all-white color scheme. 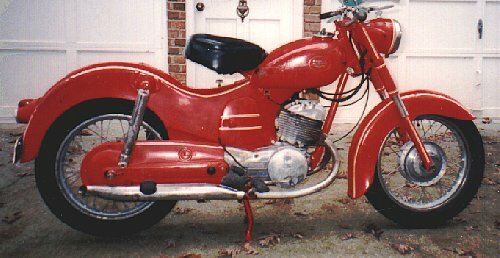 The Crusiaires were a re-badged Sears' offering of the Piaggio/Vespa 125cc and 90cc fan-cooled, twist-grip-shift, motor-scooters as sold in Europe through the 1950s and 1960s. 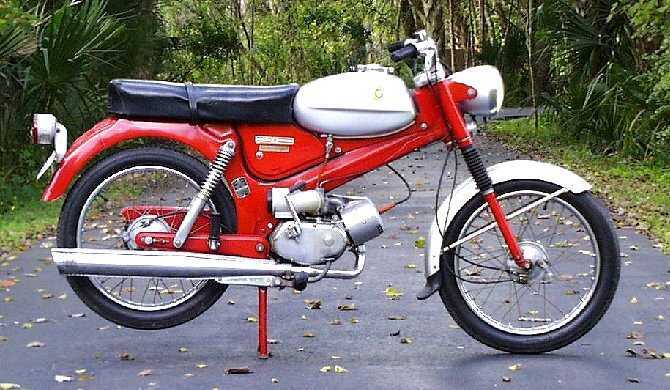 Not being a real student of these machines, I will offer that the 125cc is the most prevalent version, with the 90cc being sold near the end of Sears' exercise in the motorbike boom of the 1960s. 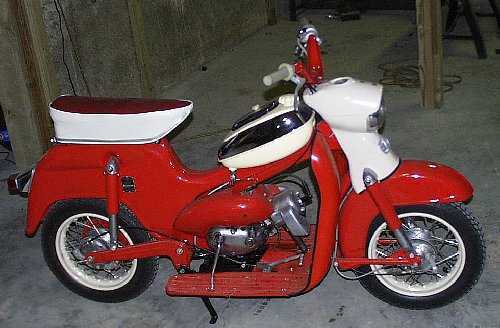 The rear body side-pods were not removable on the 90cc scooters. 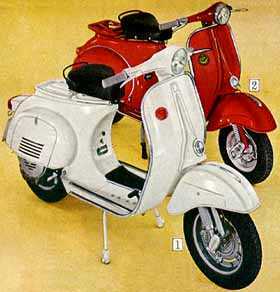 I found just this morning that the Sears Vespa scooters that I'm calling 90cc on my site are actually still 125cc. 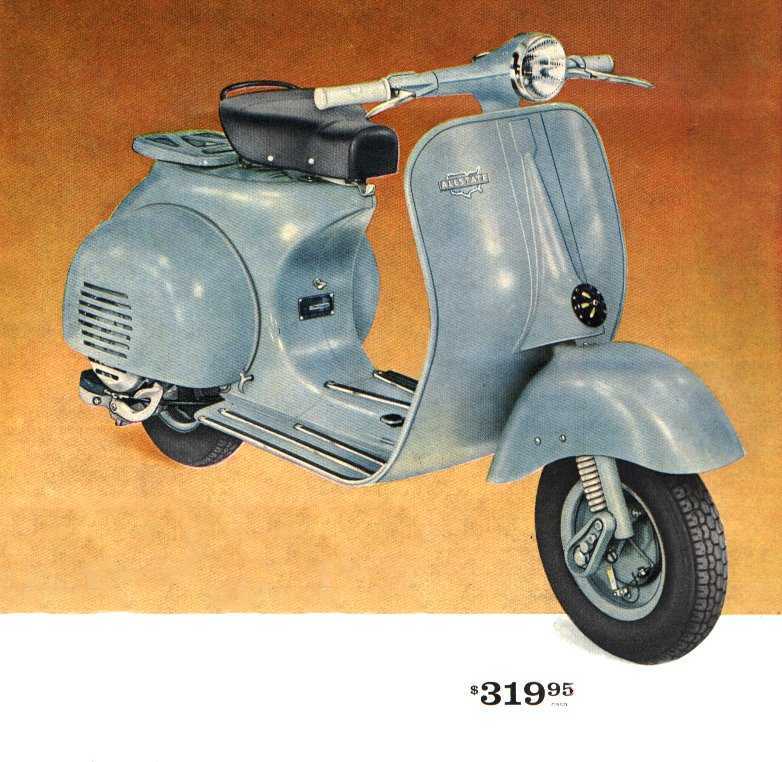 Apparently Sears did this just as the actual Vespa models in Italy were moving to 150cc. 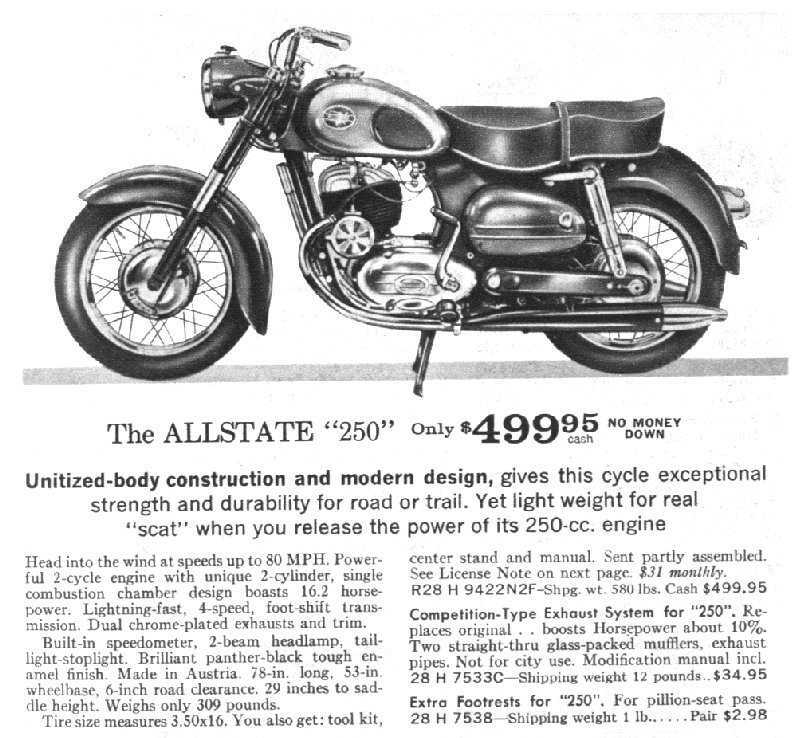 Sears did sell, I find, a 150cc for part of a model year, but I haven't covered those. This first example is the culmination of a several year search on my part for one of these very rare machines, and obviously I need a better image here too. 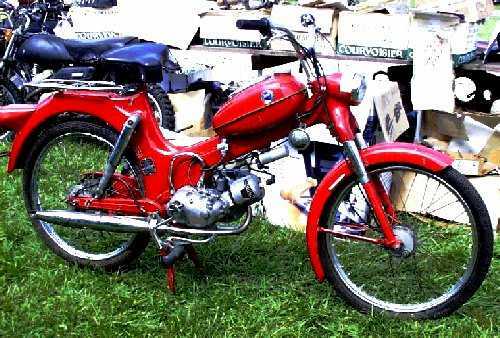 The Puch factory version participated successfully in the International Six Day Trials in the late 1950s. 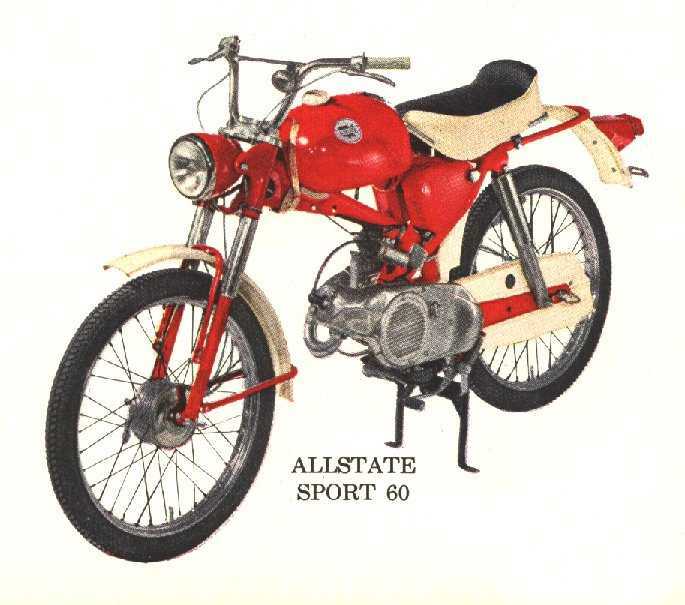 The version sold by Sears apparently had in most cases a aluminum cylinder assy utilizing the fragile chrome or Nikasil linings - especially fragile considering the "Will keep out small stones" so-called air-filters employed on these bikes. 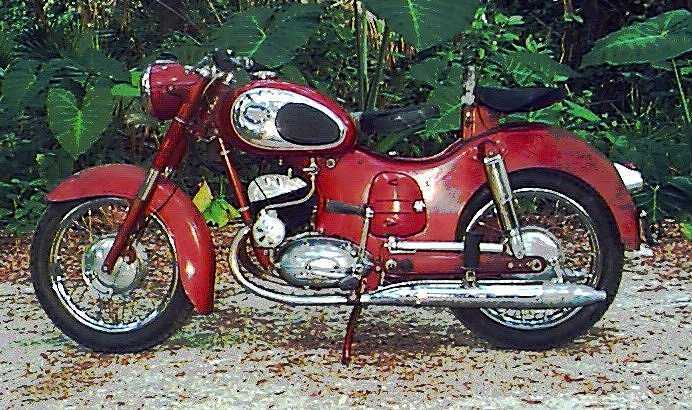 There were two carburetors, linked to open in a sequential manner, one carb either side of the cylinder. 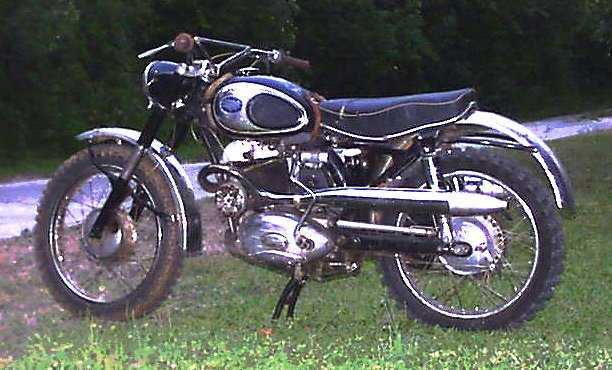 The standard 175/250 split-singles utilize only one carburetor on the left side of the jug. 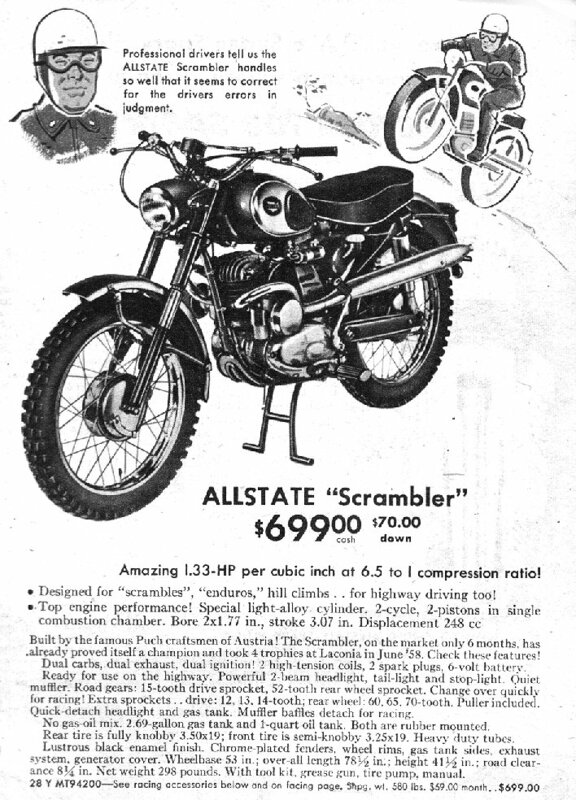 My guess is that since this bike was quite a bit more expensive than the standard 250cc, and that the typical Sears catalog or showroom shopper was not your basic off-road/ISDT enthusiast, not many were sold. These little motorbikes were just about indestrucible per my experience, as mine ran WFO the entire time I was astraddle it. The first dream of us "Catalog Wishers," mine arrived one cold Christmas morning under the tree. 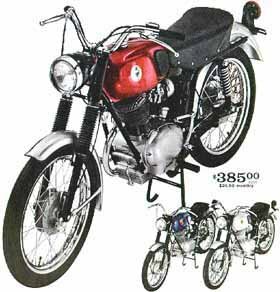 Above are a few more iterations of the Puch motorbikes as sold by Sears. Interestingly, the Campus 50 is the only one of that style I have ever seen. I bought it at VMD one year when I had unfortunately flown up, and so had to sell it before I left. Rats. 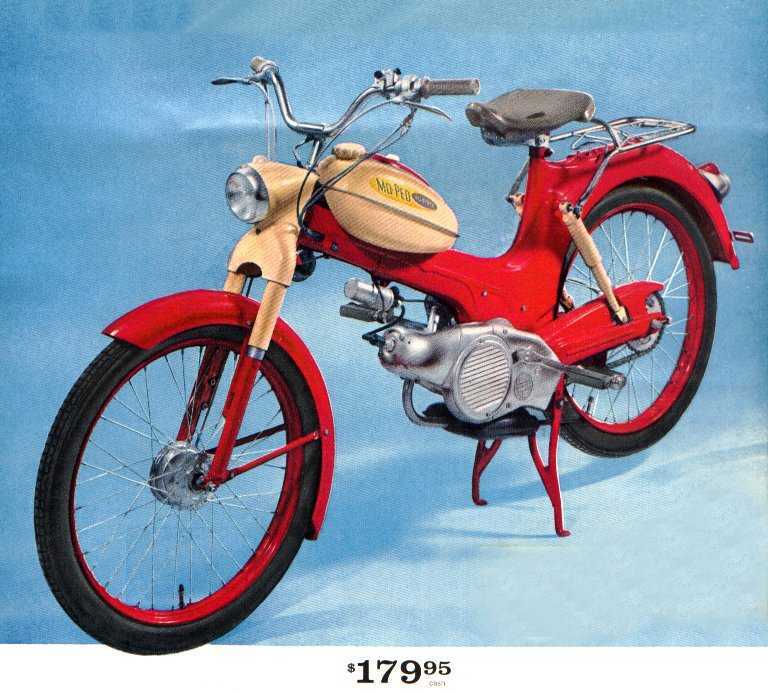 These are the re-badged Gileras sold right at the end of Sears' mid-20th-century motorcycle sales boom experiment. The 106SS was apparently sold in pretty fair numbers, as there is always one available for the collector, it he or she deigns to look. The 124 is much more rare, and seems to have been a desireable model even in its native Italy among the young cafe set, whereas the 106 is a basic commuter. Sears of course also sold the re-badged Cushmans in many forms, excepting the top of the line Eagle series.